Barbara Jackson, a well-known patron of the arts and one of UC Davis’ most loyal and generous friends, died Friday evening (Sept. 7) in Davis. She was 99 years old. 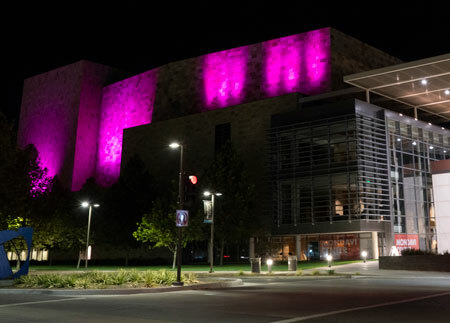 The Mondavi Center for the Performing Arts is bathed in Barbara K. Jackson’s favorite color, as the center prepares for Oct. 4’s Rising Stars of Opera concert, which has been dedicated as a celebration of her love of music. Read more in this Sept. 18 statement from the Mondavi Center. Despite her quiet manner, Jackson made a tremendous impact on the arts and philanthropy throughout Northern California. She was a familiar figure at performances in Davis, Sacramento and San Francisco, traveled the world to promote opera and support young opera singers, volunteered her time to dozens of organizations for more than six decades, and donated millions of dollars to arts programs throughout the country. A Texas native born in 1918, Barbara Jackson came to Davis in 1951 when her husband, W. Turrentine “Turpie” Jackson, joined UC Davis’ newly established College of Letters and Science. He was a preeminent historian of Western U.S. history and, while a professor at UC Davis, also served as consulting historian for Wells Fargo Bank and many other organizations. After the couple’s arrival in Davis, Mrs. Jackson quickly immersed herself in campus and community activities. Between 1951 and 1957 she worked as a secretary in the UC Davis Department of English, Dramatic Art and Speech, and from 1957 to 1965 she opened and operated The Knit Shop in downtown Davis. She also used her skills as an award-winning costume designer and wardrobe mistress to benefit her community. For more than 40 years, Jackson volunteered her time creating costumes for the Sacramento Opera, and also helped found the Davis Theatrical Costumers Guild — a group of volunteers who designed and sewed costumes, often in the Jacksons’ home, for schools and community theater groups from the 1950s through 2006. Jackson was the recipient of several prestigious UC Davis awards. In 2008, she was awarded the UC Davis Medal, the highest tribute bestowed by the university. She also received the UC Davis Foundation’s Charles J. Soderquist Award in recognition of her exceptional volunteer leadership and philanthropic support of the university, as well as the 2013 Cal Aggie Alumni Association’s Distinguished Friend of the University Award. Jackson and her husband were longtime philanthropic supporters of UC Davis. The couple made their first gift of $10 to UC Davis’ Shields Library in 1968. Since then, the Jacksons gave more than $6.5 million to UC Davis. The couple established the W. Turrentine Jackson Undergraduate Scholarship and the W. Turrentine Jackson Chair in the History of the Western United States. Later, Barbara endowed the Barbara K. Jackson Chair in Orchestral Conducting, the Barbara K. Jackson Chair in Choral Conducting, a graduate fellowship in Western U.S. history, and a graduate award in orchestral conducting. Barbara Jackson in the hall bearing her and her husband’s name. For years, Barbara and Turpie were also leading donors to the university’s arts presenting program. Barbara continued her support after Turpie’s death, sponsoring several performances each season, and underwriting the annual Rising Stars of Opera event so that the performance could be free to the public. The Rising Stars of Opera features talented young singers, many of them from the San Francisco Opera’s Adler Fellows program, which Jackson also supported. In recognition of Jackson’s support of young singers, this annual event was named The Barbara K. Jackson Rising Stars of Opera concert in 2016. Mrs. Jackson also made a significant gift in support of the UC Davis Ann E. Pitzer Center, which opened that same year, whose recital hall stage bears her name. Additionally, she made a $10,000 donation to the university to help the UC Davis Foundation reach its goal of raising $1 million to create the UC Davis Foundation Matching Fund for Student Support, and her legacy gifts to the Mondavi Center will provide $2.1 million toward a planned $2.5 million endowment to support presenting opera and classical artists. Jackson was a founding member of the Friends of UC Davis Presents (which later became Friends of Mondavi Center), a donor-based volunteer organization that supports the university’s arts presenting program; she also founded, and for many years managed, the Mondavi Center gift shop. She served as president of the University Farm Circle, was a founding and honorary member of the Mondavi Center Advisory Board, a member of the College of Letters and Science Dean’s Advisory Council, and a trustee of the UC Davis Foundation board. While Jackson took delight in and supported all of the performing arts, her greatest passion was opera. In addition to her decades of volunteer work and financial support for the Sacramento Opera and San Francisco Opera, Jackson traveled the globe to attend great opera performances and show her support for the young artists whose professional careers she had helped launch through her sponsorship of their training with San Francisco Opera’s Merola and Adler Fellows programs.